This is what brought Abbey Panels and Jaguar in contact- improving this saloon body. 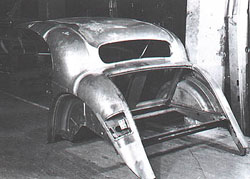 The offending panel was the rear quarter roof panel and its complex curves can be seen well here. Note the lead-filled seams. This is a Mk V – its predecessor was very similar in this area.